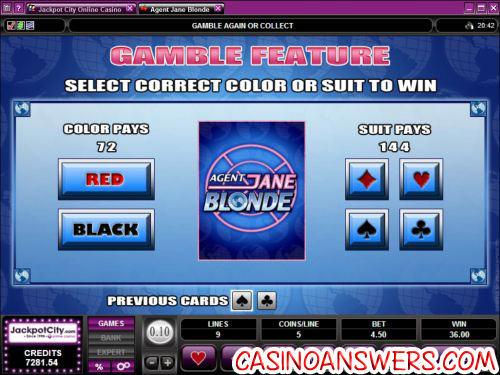 Agent Jane Blonde Video Slot Guide & Review - Casino Answers! Agent Jane Blonde is a 5-reel, 9-line video slot developed by Microgaming, featuring a wild symbol, scatter wins, multipliers, a free spins feature and a gamble feature. 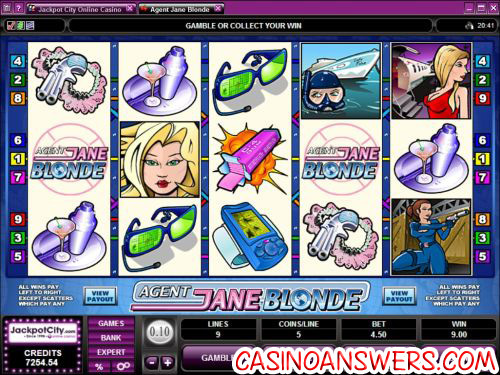 You can play the Agent Jane Blonde video slot at All Slots Casino and Blackjack Ballroom Casino. To win the 10,000 coin top jackpot on the Agent Jane Blonde slot game, you must hit 5 Agent Jane wild symbols. The Agent Jane symbol is wild and will substitute for all symbols (except scatters). It will also double your winnings, so it is a 2X multiplier as well. 3 or more Scatter Blonde symbols will trigger 15 free spins where all wins are tripled. You can always re-trigger 15 free spins during the free spins feature. All bets and lines played are the same as the spin that triggered the feature. Scatter wins are multiplied by the total number of credits staked. Scatter wins are added to payline wins. Only the highest win is paid per selected payline. All wins pay left to right except for scatters (which pay any). All wins are multiplied by credits staked per line, except scatters. Hit “Expert” to activate the autoplay mode on Agent Jane Blonde. In the advanced settings, you can set your spin settings of the number of spins (from 5 to 500) and the number of seconds between spins. Stop settings available are to stop once all wins are complete, stop when the jackpot is won, stop if a win exceeds or equals (from $25 to $2500), stop on any win, stop on free spin feature, stop if credits increase (from $25 to $2500) and stop if credits decrease (from $25 to $2500). Agent Jane Blonde is a fairly average Microgaming video slot. Not that that’s a bad thing, but it’s not the latest and greatest video slot to come from Microgaming. To play the Agent Jane Blonde video slot, please head over to All Slots Casino! Are USA players able to play the Agent Jane Blonde video slot? Unfortunately, American slots players are unable to play at Microgaming online casinos and thus cannot play the Agent Jane Blonde video slot for real money. For an excellent alternative, American players are able to sign up at Rockbet Casino and play the highly recommended Spy Game iSlot. Can I play the Agent Jane Blonde video slot in my browser? Yes, if you head over to All Slots Flash Casino, you can play an instant play version of Agent Jane Blonde that is exactly the same as the version you can find in the downloadable casino client. If you experience issues with the flash slot game, try installing the latest Adobe Flash Player. Is there a bonus game on the Agent Jane Blonde video slot? While Agent Jane Blonde lacks a bonus game feature, there is a gamble feature you can use on any win you receive. Using the gamble feature on Agent Jane Blonde, you can double or quadruple your winnings by guessing the facedown card correctly. What casinos have the agent jane blond slot machine?